Lockport Lewis Holy Name Institute "Flyers"
Holy Name Institute was opened in 1932 by the Archdiocese of Chicago, under the direction of Cardinal George Mundelein, for disadvantaged eighth grade boys who were entering high school. When it opened, 15 boys were enrolled with the tuition being waived, thanks in part to donations made to the Holy Name Society, which were matched by Chicago philanthropist and industrialist Frank J. Lewis. The grounds of the school (160 acres) were donated by Michael & Frances Fitzpatrick, who lived across the road (which was then called US 66) from the school. Bishop Bernard J. Sheil was administrator of Holy Name when it opened. Similar to one of the other schools that is listed on this website, the school could be considered one that had many names. After opening as Holy Name Institute, the name changed in 1934 to Lewis Holy Name Technical Institute to honor Frank Lewis for his generosity to fund the school, then another change a year later (Lewis Holy Name School of Aeronautics) to show the importance of offering courses in air travel as the school continued to grow towards becoming a four-year high school for boys. However, in 1936, the school was shuttered for a year before Lewis came thru again with the funds to needed to reopen the institution. This time, the school was renamed Lewis Institute and an airport was built by students and faculty. The school remained opened until 1942 when the US Navy shut down the facility to use it as a flight school for its pilots. Among the 1,200 students that attended was actor Robert Taylor, a leading man in films during the late 1940's and early '50's. When Lewis reopened in 1944, the high school only offered class work for juniors and seniors only, with a two-year junior college to follow. After the war and with many soldiers taking advantage of the GI Bill to attend college, the school stopped offering high school courses after 1948 and became a four-year college, which it remains today as Lewis University. We are not certain if there were any offered to the male students while the school was open. 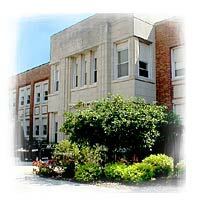 During 1932-41, the school would not have been able to be a member of the Illinois High School Association because private schools were not permitted to be members of the organization at that time, and even after that, there is no evidence of any state tournament hardware that the school may have won in athletics or extra-curricular activities that the school may have played against other schools such as Joliet Catholic or any Chicago-area parochial institution.